There has been a surprising amount of progress on the Christmas Knitting front here at Hugs. 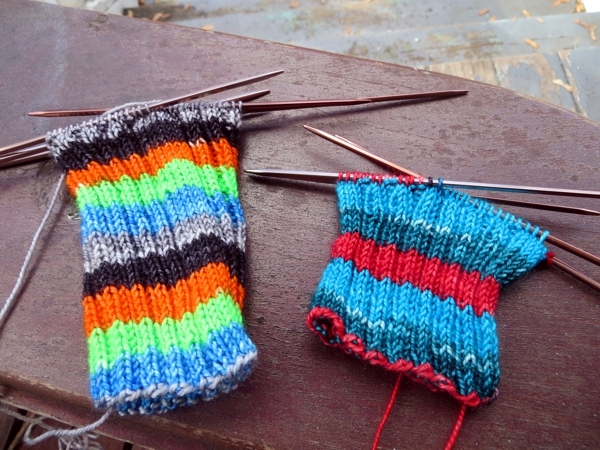 The reason is that I've set my heart on gifting two pairs of handknit socks. They are the nicest, kindest, most generous and definitely the most uncalled-for gifts I can possibly make this year and I figured out a long time ago: the only thing that gives me the most remote shot at a good Christmas is this sort of self-sacrifice through making. They are destined for the SockZombies - with the caveat that they give them back to me when they outgrow them at the end of the season, since we currently take the same size. Because there is absolutely no obligation for me to knit anything for them and because they are SockZombies and because I am putting myself through miles of ribbing just to make sure they will fit their skinny legs and not fall down, they will be amazed. 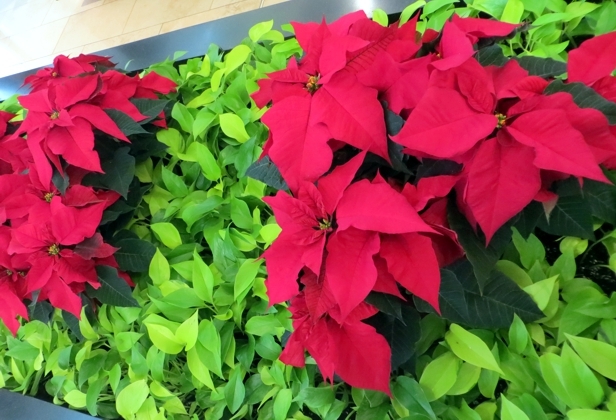 Assuming they don't get anywhere near Hugs for the next month or so - yes, I live dangerously, and yes, that's why this post started off with a picture of poinsettias. 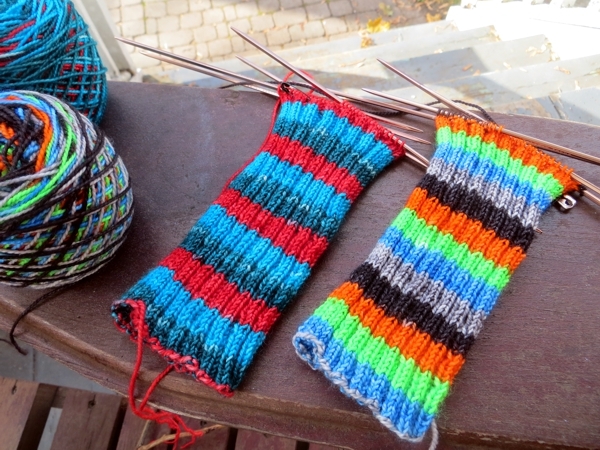 But as Trish can attest, there is absolutely nothing more boring than endless socks, and especially endless ribbing. So the fact that I am already two thirds of the way through the legs of two of these socks is amazing! And they look a bit wonky too. Still: I'm happy. These two are on shorter needles to fit in my purse, allowing me to zip through few rounds while I'm waiting for something or sitting on the subway. Judging by the advances on the at-home socks, I'll be swapping needles when I get the at-home socks over their heels, to even out the progress. I can get away with having one sock done for each SockZombie, but I don't want the second socks hanging over me on my precious Boxing Day so I'm still going to try to pull all four socks off at once. Wish me luck, and good luck to you with your gift knitting too! I added that shawl collar cowl to my cue...how pretty. And I bought some lovely buttons in October that would be so nice with it. Thanks for the distraction!